I was at college this last weekend. Our classroom is in a five star conference centre in a country house in Buckinghamshire. Between lessons we enjoyed coffee and tea from vending machines. 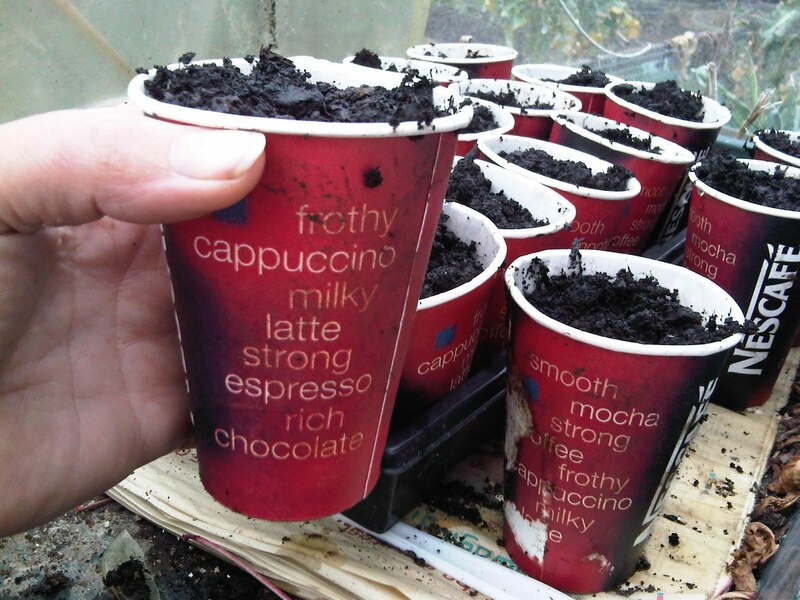 I suddenly noticed the shape of these paper cups was just perfect for re-using as root trainers! So I announced to the rest of the class that I would like all their empty cups to use as root trainers. Expecting a bit of a titter and some teasing.... but nothing! As the weekend went by, more and more paper cups appeared on my desk, without a word and willingly, and with smiles! Isn't it wonderful how times are changing? People really embrace and encourage re-using and re-cycling in their lives at the drop of a hat nowadays! I have been the weirdo, for most of my life! Having a compost bucket under the sink at home or outside the back door in the 1980s and 90s just was not cool! Neither was collecting loo rolls, getting excited at the sight of horse manure! Or pee-ing on your compost heap for that matter! Now the rest of the world has caught up! Hallelujah! Epicure new potatoes are my favourite variety without a doubt. They are not easy to find nowadays, but thanks to the internet I was able to do a word search and hunt some down from Mr Fothergills website. They are an old Scottish potato which was popular in the 1950s and I used to grow this variety and nothing else when I was growing up, helping my Dad on his allotment. Described in the catalogues as 'floury' texture (as opposed to waxy) I couldn't disagree more. Perhaps the definition of floury or waxy is not as obvious as it sounds. These are a lovely, dense new potato with the best flavour in the world. Take a tip from Matron - hunt them down and try them for yourself! Who knows whether chitting works or not. I really don't think it makes a difference. Certainly the seed potatoes are on sale in the shops much earlier than the time for planting. It was my intention to grow just two varieties this year. I just adore 'Epicure' potatoes. They are quite hard to find nowadays, a heritage variety that was popular in the 1950s. In my mind they are the best tasting new potato ever - but they were the variety I remember growing every year on my Father's allotment when I was growing up. Perhaps it is nostalgia, but the flavour is superb. 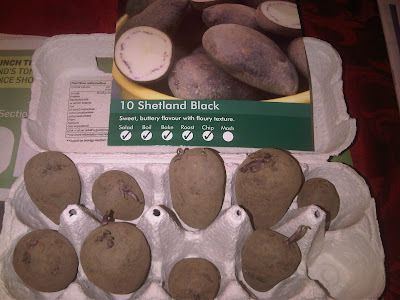 The next variety I bought is a late maturing potato 'Pink Fir Apple' just a wonderful waxy potato with a great taste. These are the two that I intended to buy. While I was in the shop at RHS Wisley the other day another variety caught my eye. 'Shetland Black' is an old variety which has become more popular in recent years - and this got me thinking... I am going to grow BLACK fruit and vegetables this year as a memorial to my lovely Buddy. The 'Buddy Morris Memorial Vegetable Patch'. So how many vegetables can I lay my hands on that have 'black' in the name? I have a tomato 'Black Cherry' and I think there is a tomato 'Black Trifele'... can anyone suggest more? If you enjoy growing veggies then you will have to get used to waiting... several months or years before you see the fruits of your labour. This is particularly true of brassicas. This is very late this year, I have just heard on the news today that up to 50% of the UK crop of PSB has been destroyed by the very harsh Winter we have just had. I planted these broccoli seeds almost a year ago! Purple Sprouting Broccoli 'Rudolph' is one of my favourites. Here they are yesterday. It is tempting to cut just one or two sprouts just for an early taste. I think I will have to wait a couple of weeks before giving in. We had a beautiful sunny day yesterday, just the thing to get them growing. My Rhubarb is starting early this year. I gave them several inches of well rotted manure compost a few weeks ago. 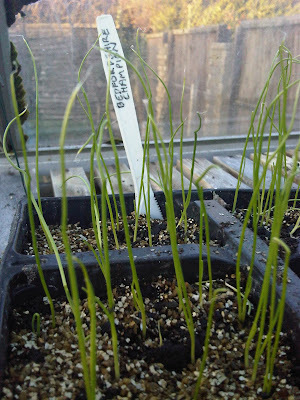 I think the long, hard Winter has given them a nice, long dormant period in which to produce these lovely, fat shoots. The second patch I mentioned a couple of posts ago, I dug up, separated and re-planted 3 spindly little growths. These are streets ahead! You might remember I planted a specially prepared potato to dig up on Christmas Day. 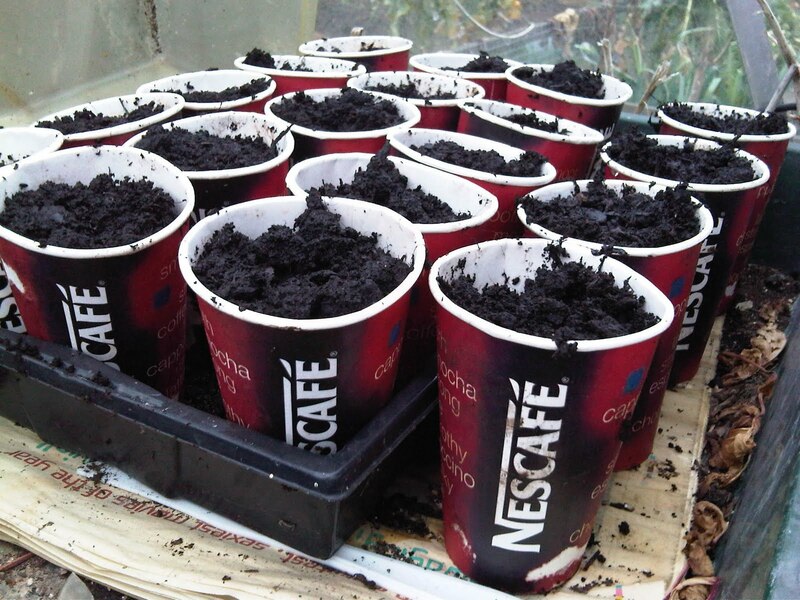 Well, I have just planted one ultra early 'Rocket' seed potato in a pot in the heated propagator in the greenhouse. 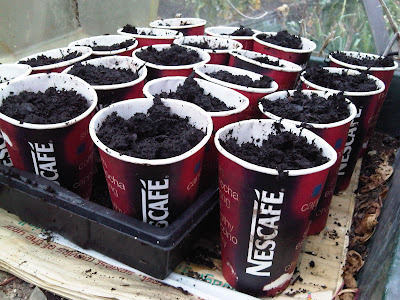 Just an experiment to see if I can grow an early crop in the greenhouse. Another trial of something new this year. I have been a big fan of Medwyn Williams for a long time. Medwyn has produced show vegetables at the RHS Show at Chelsea for many, many years. He has won more gold medals at Chelsea than I could shake a stick at! I thought I would try a Butternut Squash 'Hunter' that does really well in the UK climate. Last year at Chelsea I saw him displaying a brand new cucumber 'Delizia' and I couldn't wait to obtain seeds. They seem to be fairly similar to my furry cucumber 'Bari' that I tried last year. This type of cucumber seems to be small, light in colour, and fairly closely related to a melon. 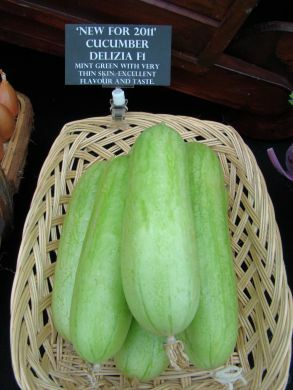 These are the new 'Delizia' cucumbers from Medwyn's. 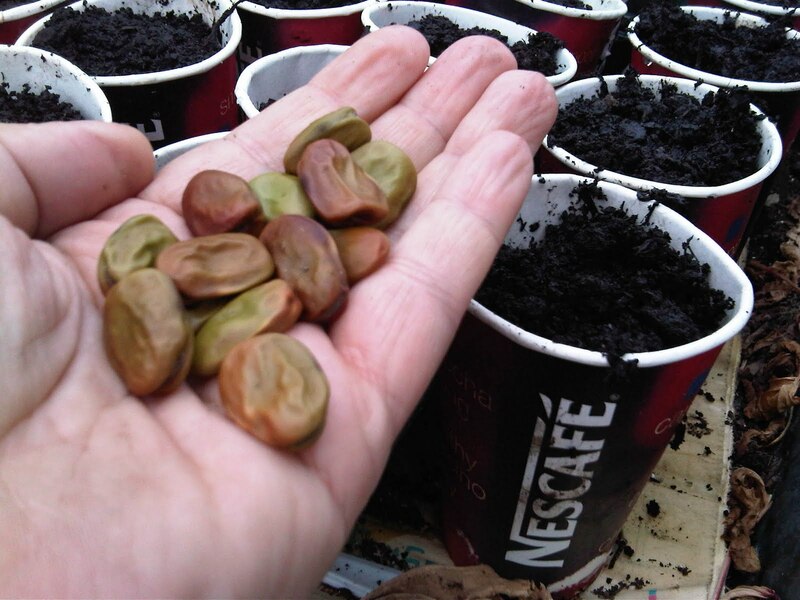 I look forward to growing them. New life is showing down in the greenhouse! My fresh Bishop's Kiss chilli seed has germinated this week. 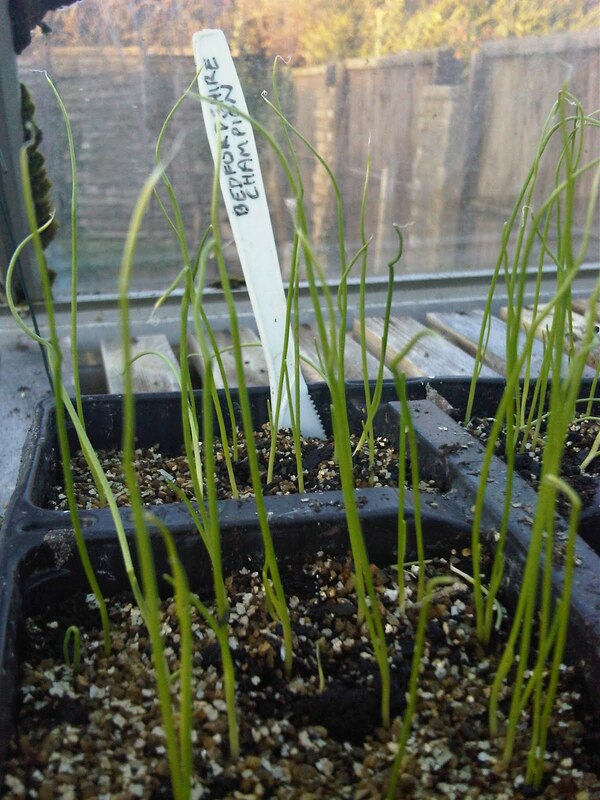 It is in a heated propagator at the moment. It is good news to see the gardening year getting off to a start. Generally, it is much too soon to be sowing most of my seeds, but chillis and peppers need such a long growing season in our British climate that it can be beneficial to get them off to an early start as long as they have heat and sufficient light so as not to get spindly. I sowed the Bedfordshire Champion onion seeds on 26th November, and they are doing quite well. Some of them I have pricked out into single modules already to try to get some early growth on them. This is how it is done for the show bench, but I have no such ambitions. 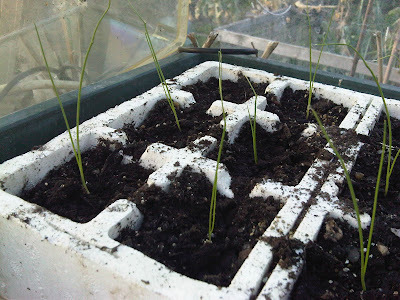 I have not grown onions from seed before, so this will be interesting to compare to those that I have grown from sets. 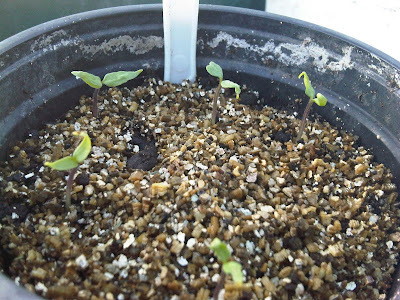 In a couple of weeks' time I might sow a few early tomato seeds in the propagator. I don't think it achieves anything by planting too early. They always catch up in the end! I'm afraid I lost my lovely Buddy this afternoon. He went to sleep peacefully on his bed at home. The time was right and I am at peace with that. I have nothing but happy memories. 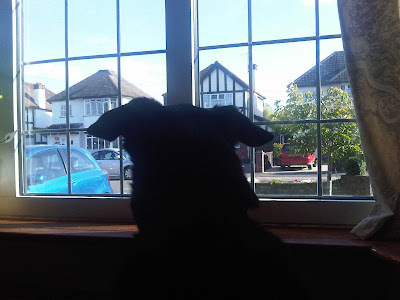 I felt it was right to bring Matron out from behind the keyboard just this once to share my favourite photo. Buddy had just won the James Bond K9 007 fancy dress competition at the RSPCA fundog show at Pinewood Studios. Our proudest moment. Thank you all for your kind wishes. You might remember that just a year ago Buddy had a small stroke. He wasn't well at all for quite a while but he made a full recovery. Poor Buddy has had another stroke. I just hope that this time at 15 years old he has the strength to make a recovery. Fingers and paws crossed this time. I know there are so many people out in blogland who will wish him well. I think I have some sort of problem with one of my rhubarb crowns. My whole rhubarb patch is only 3 years old, planted from divided crowns and has done really well for me. The problem with this section however is that the rhubarb stalks are coming up just the thickness of a pencil. All the other crowns in the same patch, with the same treatment, are nice fat buds just waiting on the surface of the soil. I'm sure I read about some sort of rhubarb virus or disease which causes spindly stalks like this. From memory I don't think there is any cure other than to dig it up and start afresh. On searching the internet most informations seems to indicate that rhubarb is fairly problem free apart from crown rot (which this is not). Does this seem familiar to anyone?